Nepal Investment Summit Press Meet in Kathmandu on Thursday. 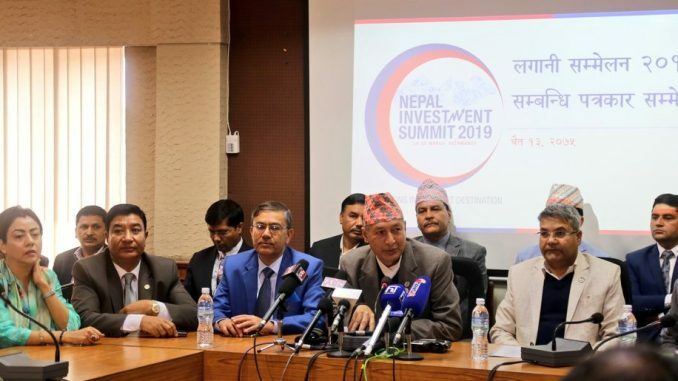 Pokhara—A total of 615 investors from 40 nations are going to take part in the 2nd Nepal Investment Summit 2019 which is going to be held by Nepal Government. The summit is scheduled for Friday and Saturday and 50 of the participants will be non residence Nepalis. The number of Nepali investors will be around 305. According to Investment Board, a total of 77 projects- 50 from government and 27 from private sector are to be showcased during the summit, informed Investment Board Chief Executive Mahaprasad Adhikari. They are from agriculture, energy, education, manufacturing industry, tourism, urban infrastructure including more others sectors. Kathmandu-Pokhara-Lumbini electric rail, Ski Resort in Manang, Milddle Kali Gandaki Hydroelectricity Project, Gandaki Technical University in Tanahun, Unified Agriculture Project in Kasi Hemja, Lake Tourism Project, Damauli Multipurpose Tourism Project, Annapurna Sikles Cable car are some of the projects selected from Gandaki Province.A dozen of projects will see the two side memorandum of understating. Representatives from Microsoft and Amazon also will attend the summit. The government believes that more investment would be attracted to Nepal as the government has amended and improved numbers of laws relating to investment. Finance Minister Yubaraj Khatiwada said that the investors would be informed about the amended laws during the summit. A press meet was organized a day before the investment summit today in Kathmandu. At the same time Federation of Nepal Chamber of Commerce and Industry president Bhawani Rana said that the summit would be the opportunity for the private sector for investment in various sectors.